STURGIS, S.D. – A spring storm that brought heavy wet snow to the Black Hills and surrounding foothills is moving east. The National Weather Service has blizzard warnings out for west-central, central and eastern South Dakota, with advisory's being allowed to expire in far western South Dakota. In Sturgis and Rapid City what was a winter storm warning, is now a winter weather advisory that will expire at 6:00 p.m. There are no longer any advisory's in effect for northwestern South Dakota and the Black Hills, along with northeastern Wyoming. Because the storm was shifting eastward, the I-90 closure was also adjusted. Department of Public Safety officials say the Interstate is closed to Mitchell from Rapid City. 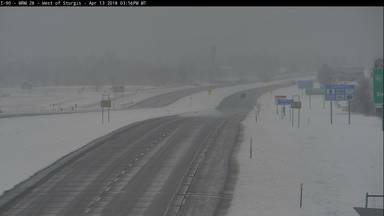 Visibility was still very poor along the Interstate east of Rapid City, and no travel advisories remain in effect tonight for most highways in west-central and central South Dakota. The No Travel Advisories in far western South Dakota had been lifted, with the exception of Highway 44 south of Rapid City. In Sturgis, main arteries were wet as of this evening. City crews continued work on them through the afternoon, and few problems were reported. Snow totals coming in from the National Weather Service included 13.5 inches in New Underwood, 6 inches near Hoover in Butte County, 7 inches in Wall, and between 7 and 8 inches of snow in Rapid City.